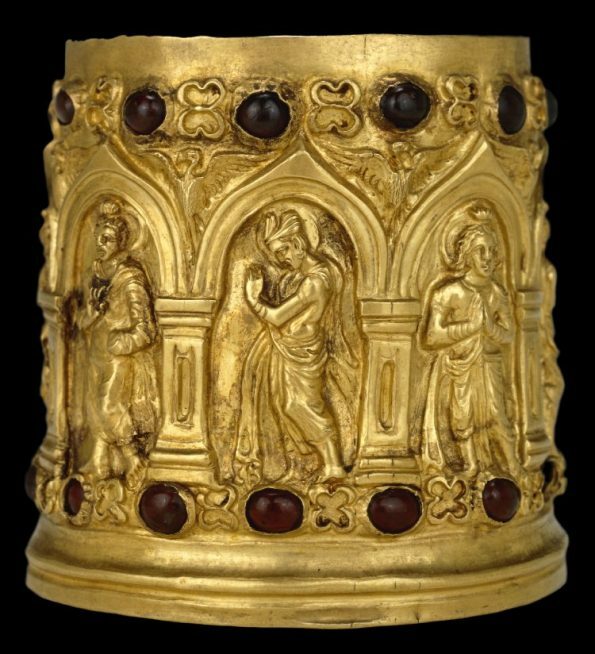 The Bimaran Casket is a small, gold reliquary which bears the earliest datable representation of the Buddha in human form. Earlier portrays of the Buddha took the form of symbols, such as footprints, a dharma wheel, or an empty throne shaded by a parasol. 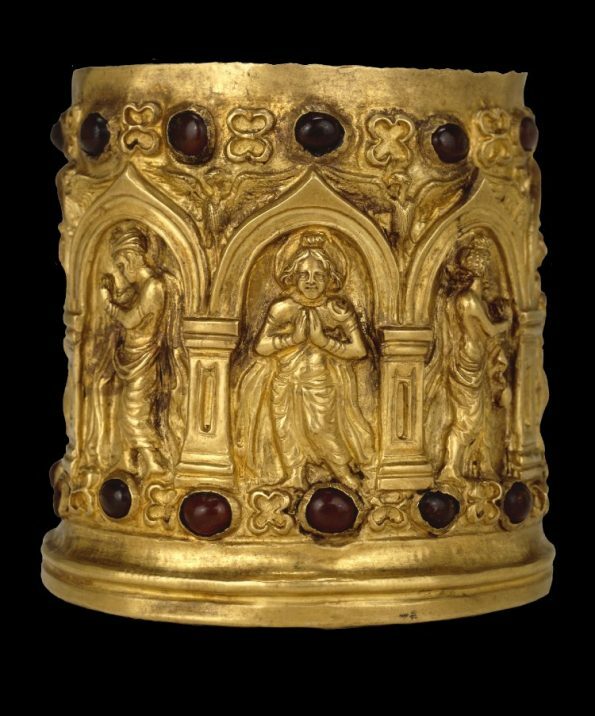 The reliquary was discovered with coins of the 1st century AD in one of the many Buddhist stupas scattered across the valleys and foothills of eastern Afghanistan south of the Hindu Kush, and is now on permanent display in the Sir Joseph E. Hotung Gallery for China and South Asia at the British Museum. 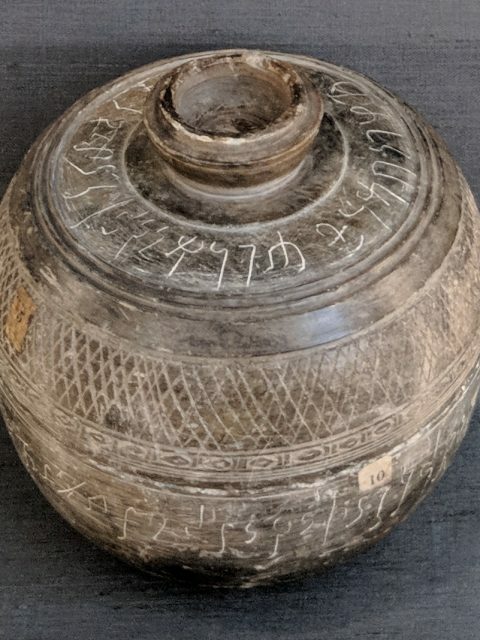 I have written a separate post on curating the Bimaran Casket in the Gandhara section of the Hotung Gallery. Gandhara was an ancient province centred on the Peshawar valley in modern-day northwest Pakistan, and Greater Gandhara refers to surrounding regions, including eastern Afghanistan. It was located on the Silk Roads, which connected South Asia with East, Central and Western Asia. Gandhara also refers to a school of Buddhist art. Buddhism may have arrived in this region from its birthplace in India in the mid-3rd century BC, and some monasteries were perhaps founded soon afterwards, but there is no concrete material evidence to confirm this. 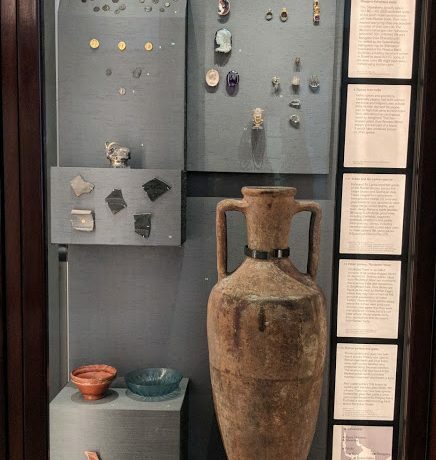 Dated inscriptions and coins from the 1st-4th centuries AD are evidence of flourishing Buddhist communities there, and some early examples of these are on display in the Hotung Gallery. 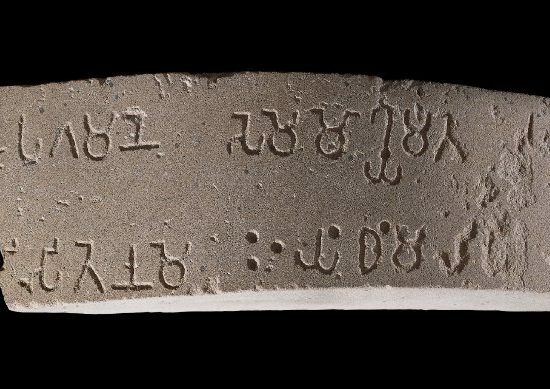 For example, the copper-plate ‘Patika’ inscription, which dates to c.AD 1-20, records the dedication of a Buddha relic and monastery in Taxila, in modern Pakistan, by the Indo-Scythian satrap (‘governor’) Patika. Following the high road from Passani, we soon reach the village of Bimaran, containing some twenty houses occupied by Tajik and Afghan families. In the very centre of the village stands a magnificent tope [stupa 3], and its present walls are built on the foundations of the ancient ones enclosing the monument. In the immediate neighbourhoods of this tope [stupa] and village we find four other similar edifices. Charles Masson (1800-53; real name ‘James Lewis’), a deserter from the East India Company’s army, was among the first Europeans to explore the ancient sites of the Kabul and Jalalabad regions, as well as the Indus Valley city of Harappa. 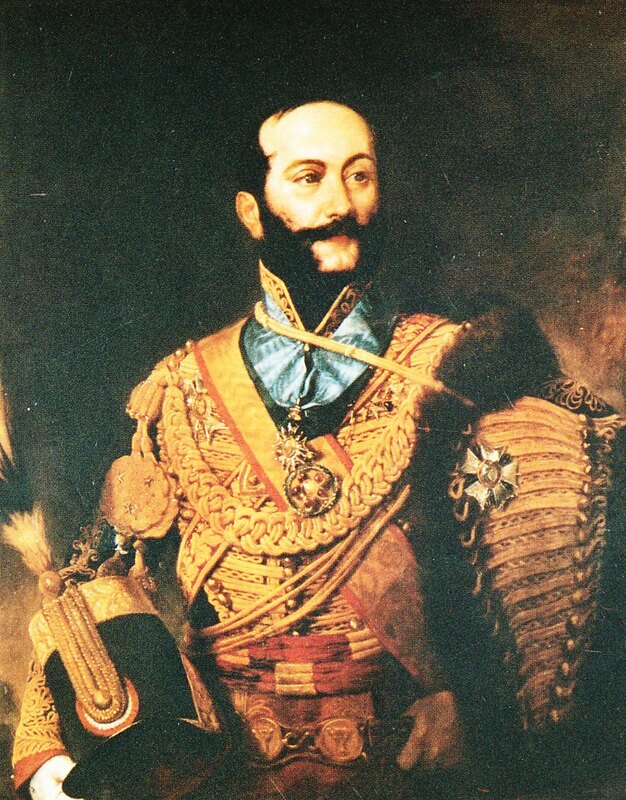 His extensive travels were aided by his good relations with local administrators and rulers, including Nawab Jabar Khan and Muhammad Akbar Khan (one of the sons of Dost Muhammad Khan, the Emir of Afghanistan), as well as the kindness of strangers he encountered, and his linguistic aptitude – he was fluent in French, Italian, Hindustani and Persian, and also knew some Pashto. Interestingly, some of the most prominent – and most prolific – European investigators of Buddhist sites in Gandhara during the early 19th century were members of Ranjit Singh’s court in Punjab. 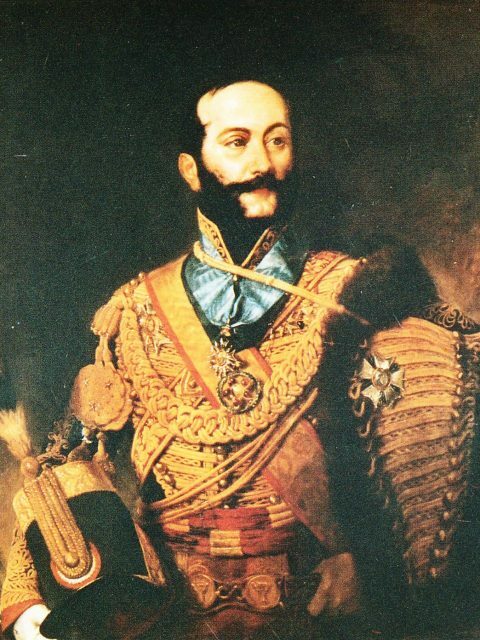 General Jean-Baptiste Ventura (1794-1858), for example, was an Italian who served in Napoleon’s army and, in 1822, travelled to Lahore where he offered his services to Ranjit Singh. Ventura took part in numerous campaigns, including the Battle of Naushera which saw the capture of the Peshawar valley for the Sikh Kingdom. He was later appointed Governor of Lahore. 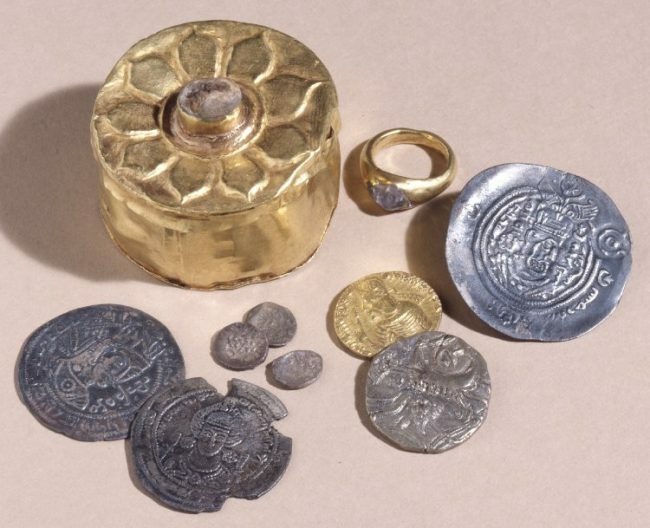 He used some of the great wealth he amassed to excavate stupas and collect coins (most of which were purchased at inflated prices from locals). One of the stupas he opened was the Great Stupa at Manikyala because he believed, wrongly, that it was the resting place of Alexander the Great’s horse, Bucephalus. 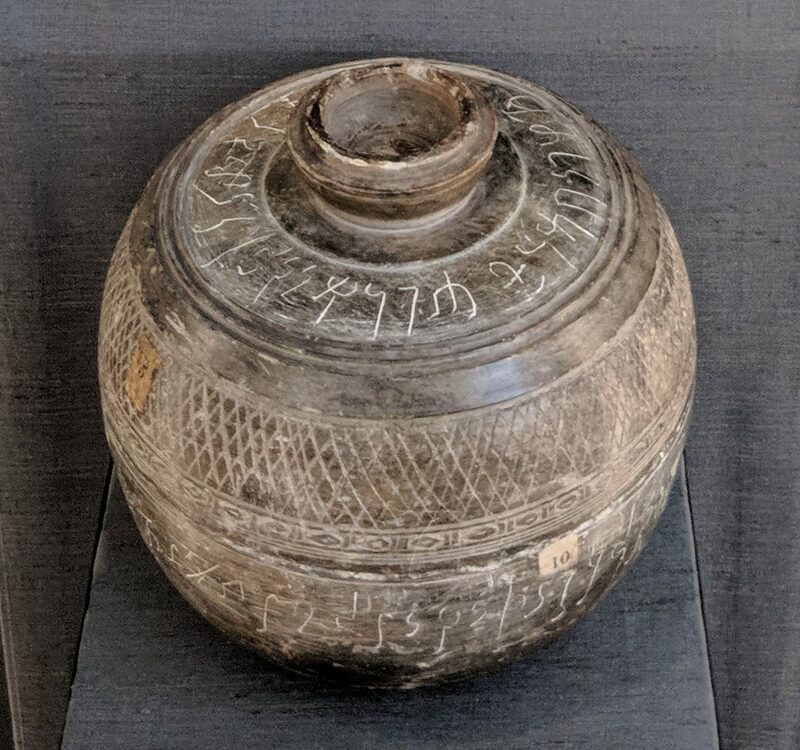 Ventura gave the finds from this stupa to the gifted linguist and master of the Calcutta mint, James Prinsep (1799-1840) who, in turn, bequeathed them to the British Museum where they are now on display in the Hotung Gallery. Following an earlier, more cursory investigation into stupa 2 at Bimaran by Dr John Martin Honigberger (1795-1869), personal physician to Maharaja Ranjit Singh, Masson re-opened the stupa and discovered a small relic cell made from slate squares with an undisturbed deposit inside. 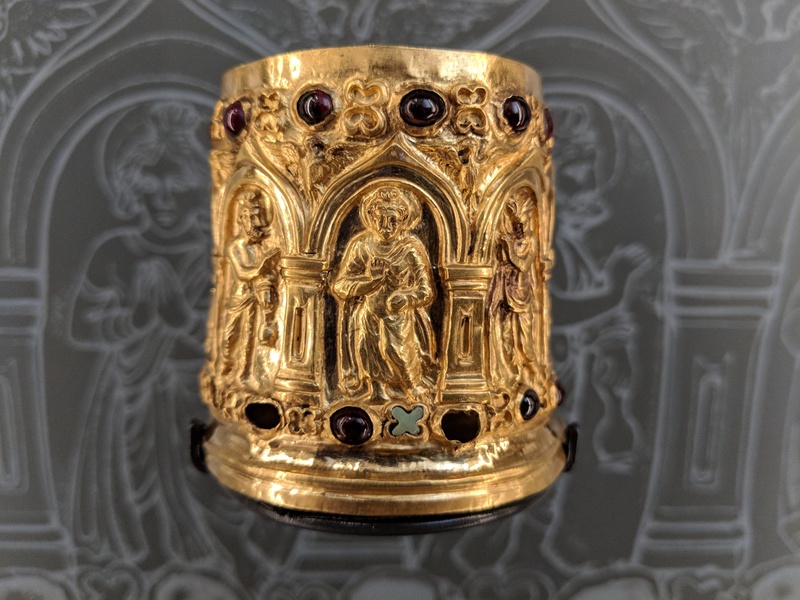 The gold casket (without a lid) was contained within a lidded stone reliquary filled with small pearl, sapphire, agate, crystal and bone beads, as well as numerous small gold ornaments and a broken bronze seal ring engraved with a seated figure. Four coins were placed next to the stone reliquary. The EIC’s Bombay Government provided Masson with annual funding towards archaeological research until 1838, in return for his finds, most of which were sent to the Company’s India Museum in London. When this museum closed in 1878, the collections were transferred to the South Kensington Museum (now ‘V&A’) before being dispersed. Between 1880 and 1882, all of the ‘antiquities’ and coins were sent to the British Museum and the Bimaran gold reliquary was transferred to the British Museum by the Secretary of State for India in 1900. The labels ‘10’ and ‘5’ seen on the body and lid of the stone reliquary which contained the gold casket date from the time they were in the India Museum. Masson’s detailed notes and drawings concerning his finds from Bimaran and elsewhere are now held among the India Office collections at the British Library. 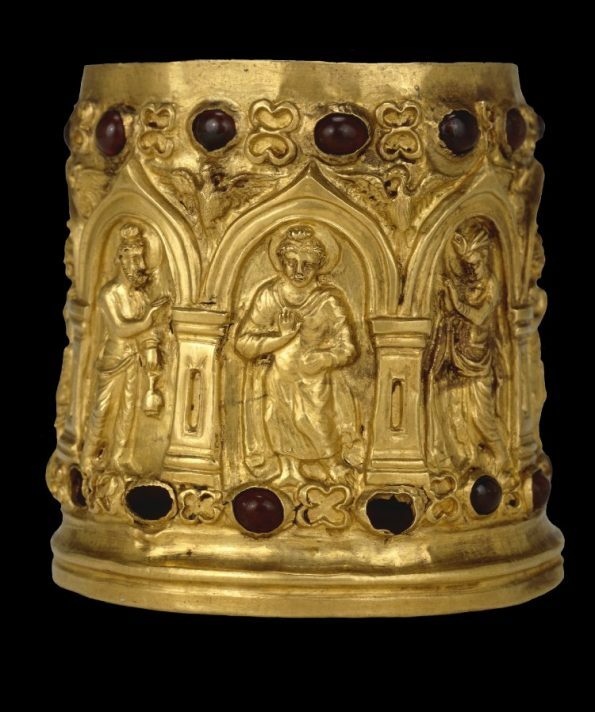 The size and intricate detailing of the Bimaran Casket set it apart from the handful of other, much smaller and plain gold reliquaries that have been found in Greater Gandhara. 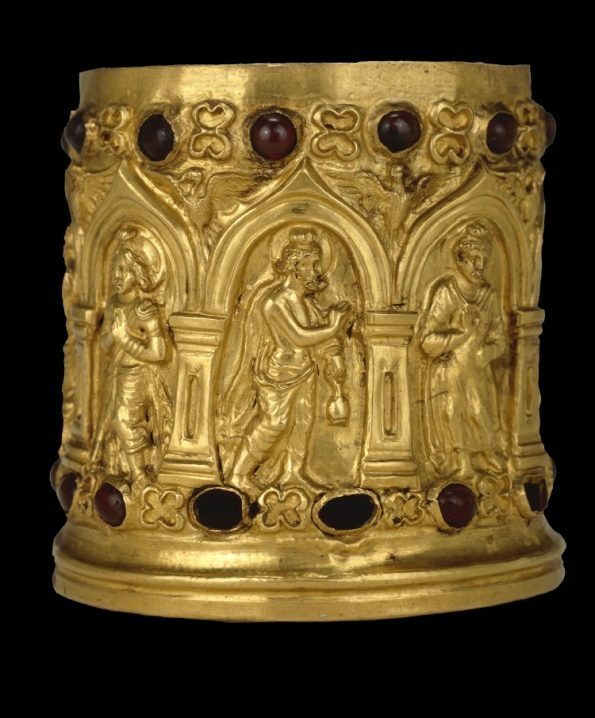 Questions still remain about where and by whom it was manufactured, although there are links with the spectacular gold objects found in the burial mounds of Tillya Tepe, in northern Afghanistan, which are believed to date to c.1st century AD. 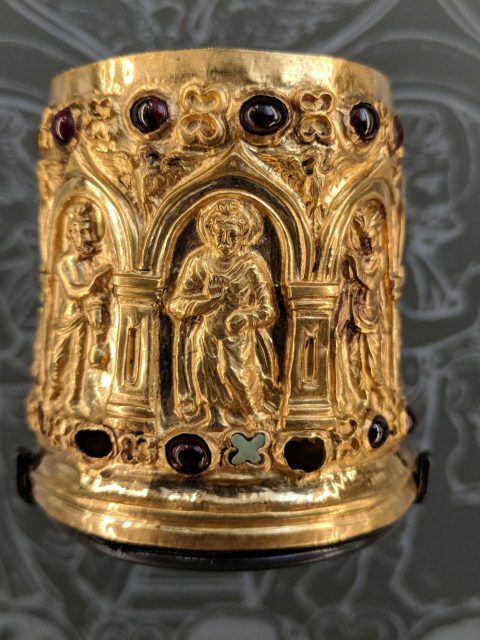 The metal reliquary is cylindrical in shape and inset with a band of garnets around the top and base. Originally, there were also turquoise inlays between the garnets, but these had fallen out at some point before or during the reliquary’s interment in the stupa. 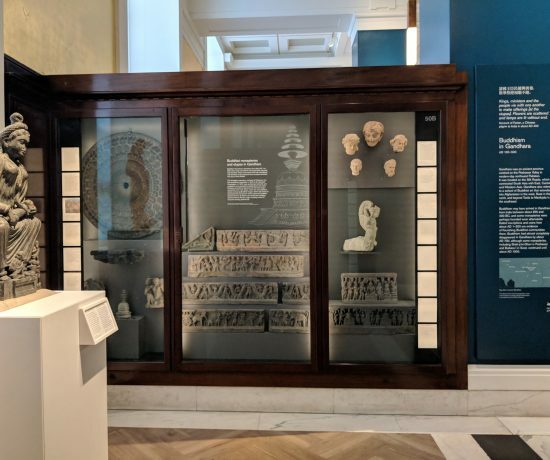 As part of the conservation work for the Hotung Gallery redisplays, Rachel Berridge, Senior Conservator: Ceramics, Glass and Metal at the British Museum, replaced the surviving turquoise inlays. The gold casket was found without a lid but, given the unfinished state of the rim, it is likely that it originally had one. On the central section of the casket are eight arches which have eagles with outspread wings shown between them, and under the arches stand four haloed figures depicted twice. The Buddha wears long, draped robes and has an uṣṇīṣa (cranial bump symbolising spiritual prowess), while his hands are in Abhaya Mudrā (the gesture of dispelling fear). He is worshipped by Brahma, who stands to Buddha’s right, and Indra, who stands to Buddha’s left. Brahma is depicted as an acetic with a beard and topknot, wearing a dhoti and uttarīya (the cloth over his shoulder) and holding a water-pot. Indra is shown wearing the garb of a prince, with an armlet and bracelets and a turban, as well as the traditional draped upper and lower body garments. Although he is not carrying one here, Indra is sometimes depicted holding a vajra (thunderbolt). Brahma and Indra are also found in set scenes with the Buddha in Gandhara sculpture, such as when they entreat him to preach the Dharma. The identity of the fourth figure is more ambiguous. He wears flowing upper and lower garments and is bedecked in jewellery while standing with his hands in Añjali Mudrā (gesture of greeting or reverence). Traditionally, he has been interpreted as a Bodhisattva, usually Maitreya (the future Buddha). Notably, but not unusually in Kharoṣṭhī Buddhist inscriptions, the name is not Buddhist: in this case, Śivarakṣiṭa is a Śaivite, name. This particular name is found in other inscriptions of the early centuries AD in Gandhara – one of the many aspects which contribute to the dating of the casket. 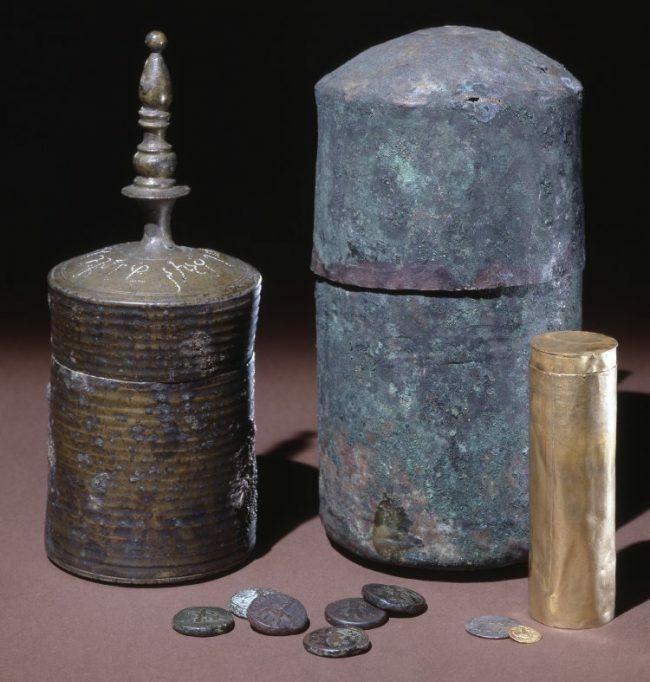 Another factor which helps to date the gold casket are the four coins which were discovered in the cell containing the deposit. These were coins of Mujatria (c.AD 80-90), an Indo-Scythian (‘Saka’) satrap and the son of another satrap, Kharahostes. While the contents of reliquaries found in Gandhara and environs vary considerably, the majority contain beads made from many-coloured precious and semi-precious stones, pearls, bone and, more rarely, also small gold ornaments, some of which may once have embellished clothing, and others in the shape of stylised flowers. Alongside these objects, calcined bones and ash are also sometimes found. According to Buddhist tradition, these differently coloured beads were seen as the transformation of different parts of the Buddha’s body during his cremation and, therefore, actual Buddha relics in a similar way to bone and ash. Recently, work on the Bimaran Casket has continued in collaboration with conservators at the British Museum, to learn more about the way in which the casket was manufactured and the materials that were used. This will tell us a lot more about ancient manufacturing techniques, as well as ancient trading and cultural links. 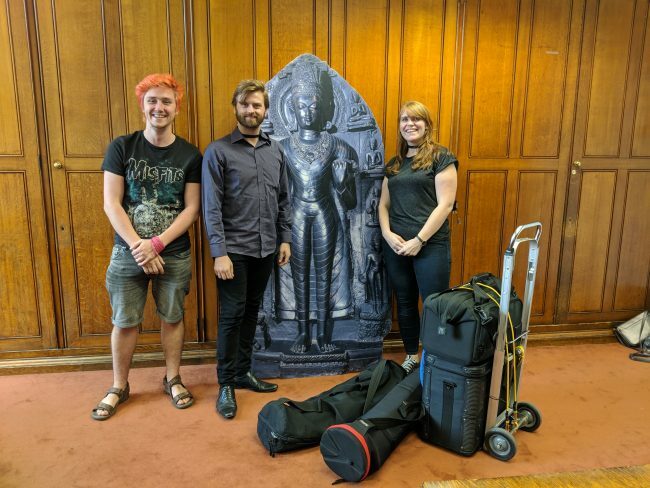 I had great fun filming an episode of Curator’s Corner focusing on the Bimaran Casket – it was the first time I had done anything quite like this! 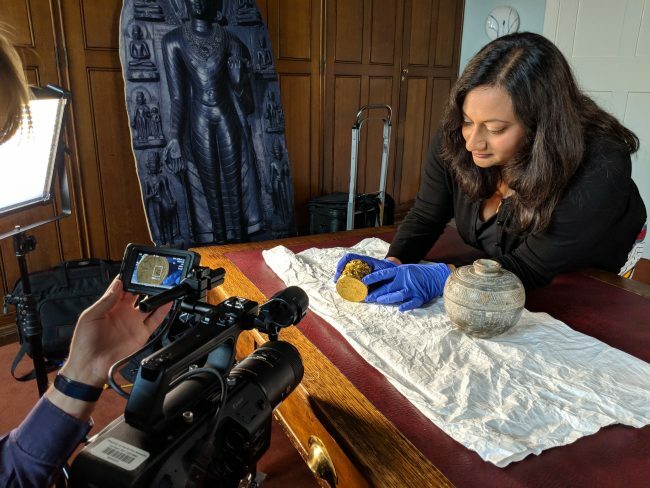 Lee (our cameraman) managed to get some incredible close-up shots of both reliquaries, including the stunning lotus petal base of the gold casket, as well as the inscription and interior of the stone reliquary. The rather fab office we are filming in isn’t mine, by the way; it belongs to Jane Portal, my Head of Dept., who kindly let us take it over for a couple of hours! You can see the video here – https://youtu.be/NZMqY3d-dQA There will also be a second video which looks more closely at the collecting history and I will post the link when it is available. Much of the detailed information in this blogpost is based on Dr Elizabeth Errington’s extensive research on Charles Masson and his collections. I was fortunate to work with Dr Errington as a volunteer under the aegis of her Masson Project at the British Museum, and it was here that I first encountered Masson and the Bimaran Casket. I remain deeply grateful to her for sharing her knowledge so generously and correcting me where I go wrong!